For other people named George Catlin, see George Catlin (disambiguation). Not to be confused with George Carlin. 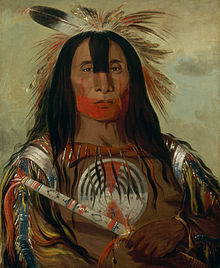 George Catlin was born in Wilkes-Barre, Luzerne County, Pennsylvania. As a child growing up in Pennsylvania, Catlin had spent many hours hunting, fishing, and looking for American Indian artifacts. His fascination with Native Americans was kindled by his mother, who told him stories of the western frontier and how she was captured by a tribe when she was a young girl. Years later, a group of Native Americans came through Philadelphia dressed in their colorful outfits and made quite an impression on Catlin. His early work included engravings, drawn from nature, of sites along the route of the Erie Canal in New York State. Several of his renderings were published in one of the first printed books to use lithography, Cadwallader D. Colden's Memoir, Prepared at the Request of a Committee of the Common Council of the City of New York, and Presented to the Mayor of the City, at the Celebration of the Completion of the New York Canals, published in 1825, with early images of the City of Buffalo. Following a brief career as an attorney, Catlin produced two major collections of paintings of American Indians and published a series of books chronicling his travels among the native peoples of North, Central, and South America. Spurred by relics brought back by the famous Lewis and Clark Expedition of 1804–1806 owned by his friend, Charles Willson Peale, and claiming that his interest in America's 'vanishing race' was inspired by a visiting American Indian delegation in Philadelphia, he set out to record the appearance and customs of America's native peoples. Catlin began his journey in 1830 when he accompanied Governor William Clark on a diplomatic mission up the Mississippi River into Native American territory. St. Louis became Catlin’s base of operations for five trips he took between 1830 and 1836, eventually visiting fifty tribes. Two years later he ascended the Missouri River more than 3000 km to Fort Union Trading Post, near what is now the North Dakota-Montana border, where he spent several weeks among indigenous people who were still relatively untouched by European culture. He visited eighteen tribes, including the Pawnee, Omaha, and Ponca in the south and the Mandan, Hidatsa, Cheyenne, Crow, Assiniboine, and Blackfeet to the north. There he produced the most vivid and penetrating portraits of his career. During later trips along the Arkansas, Red, and Mississippi rivers, as well as visits to Florida and the Great Lakes, he produced more than 500 paintings and gathered a substantial collection of artifacts. When Catlin returned east in 1838, he assembled the paintings and numerous artifacts into his Indian Gallery, and began delivering public lectures that drew on his personal recollections of life among the American Indians. Catlin traveled with his Indian Gallery to major cities such as Pittsburgh, Cincinnati, and New York. He hung his paintings "salon style"—side by side and one above another. Visitors identified each painting by the number on the frame, as listed in Catlin's catalogue. Soon afterward, he began a lifelong effort to sell his collection to the U.S. government. The touring Indian Gallery did not attract the paying public Catlin needed to stay financially sound, and the United States Congress rejected his initial petition to purchase the works. In 1839 Catlin took his collection across the Atlantic for a tour of European capitals. As a showman and entrepreneur, he initially attracted crowds to his Indian Gallery in London, Brussels, and Paris. 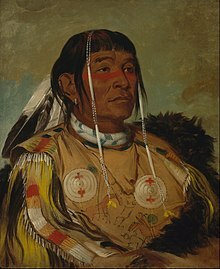 The French critic Charles Baudelaire remarked on Catlin’s paintings, "He has brought back alive the proud and free characters of these chiefs, both their nobility and manliness." Catlin wanted to sell his Indian Gallery to the U.S. government to have his life’s work preserved intact. His continued attempts to persuade various officials in Washington, D.C. to buy the collection failed. In 1852 he was forced to sell the original Indian Gallery, now 607 paintings, due to personal debts. The industrialist Joseph Harrison acquired the paintings and artifacts, which he stored in a factory in Philadelphia, as security. Catlin spent the last 20 years of his life trying to re-create his collection, and recreated more than 400 paintings. This second collection of paintings is known as the "Cartoon Collection", since the works are based on the outlines he drew of the works from the 1830s. In 1841 Catlin published Manners, Customs, and Condition of the North American Indians, in two volumes, with approximately 300 engravings. Three years later he published 25 plates, entitled Catlin’s North American Indian Portfolio, and, in 1848, Eight Years' Travels and Residence in Europe. From 1852 to 1857 he traveled through South and Central America and later returned for further exploration in the Far West. The record of these later years is contained in Last Rambles amongst the Indians of the Rocky Mountains and the Andes (1868) and My Life among the Indians (ed. by N. G. Humphreys, 1909). Paintings of his Spanish American Indians are published. In 1872, Catlin traveled to Washington, D.C. at the invitation of Joseph Henry, the first secretary of the Smithsonian. Until his death later that year in Jersey City, New Jersey, Catlin worked in a studio in the Smithsonian "Castle". In 1879 Harrison’s widow donated the original Indian Gallery, more than 500 works, along with related artifacts, to the Smithsonian. The nearly complete surviving set of Catlin's first Indian Gallery, painted in the 1830s, is now part of the Smithsonian American Art Museum's collection. The associated Catlin artifacts are in the collections of the Department of Anthropology, National Museum of Natural History, Smithsonian. Some 700 sketches are held by the American Museum of Natural History, New York City. Some artifacts from Catlin are in the University of Pennsylvania Museum of Archaeology and Anthropology collections. The Huntington Library in San Marino, California also holds 239 of Catlin's illustrations of both North and South American Indians, as well as other illustrative and manuscript material by Catlin. The accuracy of some of Catlin's observations has been questioned. He claimed to be the first white man to see the Minnesota pipestone quarries, and pipestone was named catlinite. Catlin exaggerated various features of the site, and his boastful account of his visit aroused his critics, who disputed his claim of being the first white man to investigate the quarry. Previous recorded white visitors include the Groselliers and Radisson, Father Louis Hennepin, Baron LaHonton, and others. Lewis and Clark noted the pipestone quarry in their journals in 1805. The fur trader Philander Prescott had written another account of the area in 1831. Catlin appears to have written an eccentric book, which was in an eighth edition by 1882, entitled Shut Your Mouth. This is a serious essay suggesting that all manner of ills arise in people who were slack jawed, people who do not routinely keep their mouths closed. The title page of the eighth edition says "by George Catlin, author of 'Notes of Travels Amongst the North-American Indians' Etc., Etc." A facsimile of a signature appears on the book's last page. In it, the author claims that even too much talking is harmful because of the mouth being open for the purpose. "There is no person in society but who will find... improvement in health and enjoyment..." from keeping his or her mouth shut. The work runs to 102 pages. He signs a note at the end of the eighth edition "The Author, Rio Grande, Brazil, 1860". George Catlin met Clara Bartlett Gregory in 1828 in her hometown of Albany, New York. After their marriage, she accompanied him on one of his journeys west. They eventually had four children. Clara and his youngest son died while visiting Paris in 1845. Many historians and descendants believe George Catlin had two families; his acknowledged family on the east coast of the United States, but also a family farther west, started with a Native American woman. Larry McMurtry includes Catlin as a character in his The Berrybender Narratives series of novels. In the historical novel The Children of First Man, James Alexander Thom recreates the time Catlin spent with the Mandan people. The 1970 film A Man Called Horse cites Catlin's work as one of the sources for its depiction of Lakota Sioux culture. Catlin and his work figure repeatedly in the 2010 novel Shadow Tag by Louise Erdrich, where he is the subject of the unfinished doctoral dissertation of character Irene America. Catlin, George (1876). Illustrations of the manners, customs & condition of the North American Indians, Vol. 1. London: Chatto & Windus. ISBN 978-1543245981. Retrieved August 23, 2014. Catlin, George (1876). Illustrations of the manners, customs & condition of the North American Indians, Vol. 2. London: Chatto & Windus. ISBN 978-1543246858. Retrieved August 23, 2014. Catlin, George (1861). Life Among the Indians. London: Gall and Inglis. Retrieved August 24, 2014. ^ "Catlin Virtual Exhibition". Smithsonian American Art Museum. Archived from the original on 25 Sep 2014. Retrieved 28 October 2014. ^ Laurence M. Hauptman; George Hamell (2003). "George Catlin: The Iroquois Origins of His Indian Portrait Gallery". In Alexander Clarence Flick (ed.). New York History: Quarterly Journal of the New York State Historical Association. 84. The Association. p. 125. ...nevertheless, the artist, who viewed himself as a visual historian documenting a "vanishing race," produced a wide array of portraits and landscapes that provide us with a partial glimpse into Indian Country from the late 1820s until the artist's death in 1872. ^ George Catlin (1842). Letters and Notes on the Customs and Manners of the North American Indians. I. London: Tilt and Bogue, Fleet Street. p. 16. ^ "George Catlin". Smithsonian American Art Museum. Retrieved 2012-08-10. ^ South American Indian paintings by George Catlin. Washington, D.C.: National Gallery of Art, 1992. ^ "SAAM: George Catlin and His Indian Gallery". Retrieved 28 April 2018. ^ "Pipestone County History -- National Register of Historic Places Pipestone, Minnesota Travel Itinerary". www.nps.gov. Retrieved 28 April 2018. ^ "National Rivers Hall of Fame Inductees - National Mississippi River Museum & Aquarium". www.rivermuseum.com. Retrieved 28 April 2018. ^ "'Shadow Tag,' by Louise Erdrich". Retrieved 28 April 2018. Catlin, George. Letters and Notes on the Manners, Customs and Conditions of North American Indians: The Complete Volumes I and II: Ilustrated. ISBN 978-1542900294. Blizzard, Gladys S. (1996). Come Look with Me: World of Play. Lickle Publishing. ISBN 1-56566-031-5. Conn, Steven (2004). History's Shadow: Native Americans and Historical Consciousness in the Nineteenth Century. University of Chicago Press. ISBN 0-226-11494-5. Eisler, Benita (2013). The Red Man's Bones: George Catlin, Artist and Showman. W. W. Norton & Company. ISBN 978-0-393-06616-6. Wikimedia Commons has media related to George Catlin. Wikisource has the text of the 1911 Encyclopædia Britannica article Catlin, George. Catlin cradle, Catalogue No. E73311, Department of Anthropology, NMNH, Smithsonian Institution. This page was last edited on 11 April 2019, at 01:49 (UTC).